On Tuesday, Indonesia officially designated the Dampier Strait as a protected TURF (Territorial Use Rights in Fisheries) network. At 211,000 hectares and encompassing 19 villages, the Dampier Strait network is the largest comprehensive TURF-Reserve network in the world. This year-long effort is supported by the United States Government through the United States Agency for International Development Sustainable Ecosystems Advanced (USAID SEA) project and Rare within Indonesia. The Dampier Strait TURF Network lies within the larger Dampier Marine Conservation Area, a marine area protected by the Indonesian government in 2014. 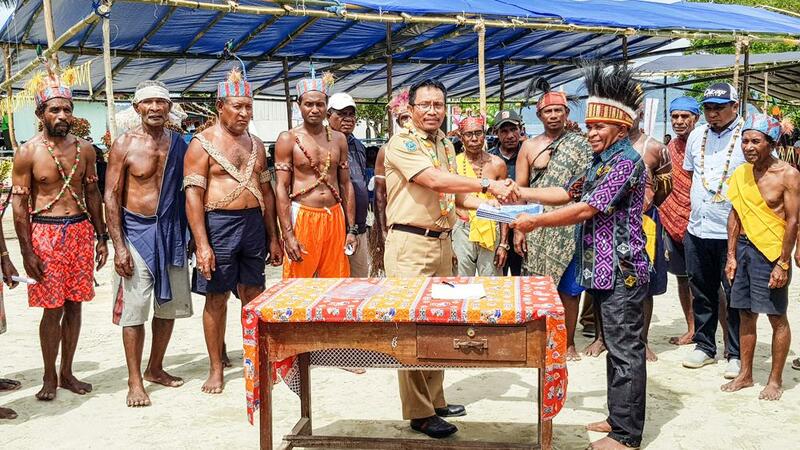 The formal agreement, led by the Maya Tribe Adat Council in Raja Ampat, West Papua, and signed by 58 local leaders in the Dampier Strait, has established 21 areas of protected inshore marine waters where user rights to local have been designated. The agreement includes a range of new fisheries regulations (minimum size limits on fish, prohibiting destructive fishing, as well as area and seasonal restrictions) to secure a sustainable food supply for local indigenous groups. Today’s announcement is the result of an investment made by Feed the Future, the U.S. Government’s global hunger and food security initiative, into the USAID SEA project to ensure that improvements in coastal fisheries management also contribute to strengthened food and livelihood security for local communities. The USAID SEA project is a five-year initiative to support marine conservation and improved fisheries management in Indonesia. Over the past year, USAID SEA partnered with Rare to work with the Maya Tribe Adat Council and other government and community leaders to develop policy and regulatory pathways, engage communities to identify key fisheries and develop site selection, and work on economic development and financial inclusion opportunities. A central tenet of Rare’s fisheries program Fish Forever is improving food security by securing sustainable fisheries for coastal communities. In Dampier Strait, Rare’s village surveys found that households within the Marine Protected Area were “food insecure.” The designation of Dampier Strait as a TURF Reserve network will improve local food security by providing a sustainable source of protein (fish) for Indigenous communities heavily reliant on small scale fisheries as well as protect important marine habitats such as coral reefs and seagrass beds. Additionally, Fish Forever and USAID SEA aim to empower women in local fishery enterprises, to build food security for their villages. Today’s announcement builds on a strong history of work in the region with other partners including the World Wildlife Fund, Conservation International, and The Nature Conservancy. Rare has partnered with these organizations to combat coastal overfishing, the most immediate threat to our oceans and the communities that depend on them. Indonesia’s coastal fisheries are an essential source of food, income and cultural heritage to its people. Sixty percent of Indonesian fishers, or 1.6 million people, are small-scale fishers, and 85% of their catch is used for human consumption. Indonesia has the second longest coastline in the world, and 40% of the population (roughly 100 million people) lives near the coast. Coastal fisheries therefore play an essential role in national food security and nutritional health in this archipelagic nation.